College Lake again – Neil Baldwin's blog : Warning contains walking, technology, photography, holidays. Decided a local trip was in order, so we invited Helen’s folks for a walk round College Lake. The weather was really sunny and hot, we got there at about 11ish so not the best time of day to see birds. The usual suspects were on the water and island adjacent to the entrance. We walked on round the side twards the far end. In the wooded are just pas the sand martin nest area I spotted an unusual plant that looked very primitive as plants go. 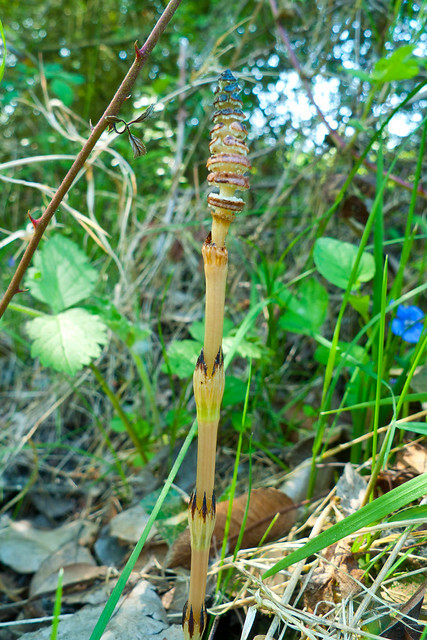 It was a long stalk (6 inches) with with 4 regular buds on evenly spaced up the stem, topped off with a blobby bit. 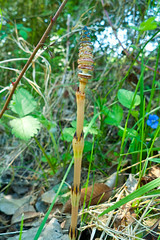 It turned out to be a Shady Horsetail (Equisetum pratense). We were soon down to the field where the shrubs are planted. I scanned the fences ofor birds and spotted what I thought mightbe a Cuckoo. IIt was distamt so I got a bit closer and was more convinced. When it flew closer onto another post there was not doubt, later on on we all heard it call one time. In the filed near the cuckoo were 4 Whetear. We finished off the walk with Ice Cream for some and a soft drink for others.